Tori, this is for you, sweetie. And for you, all my sweeties, all of you who pass by (my darling friends!) too! Now I do realize that a lot of us have children sporting permanent teeth already (in which case, I certainly hope they don’t lose any just so you can use this kit, hahaha) … but as usual I tried to incorporate parts of this kit that anyone can find useful (especially the papers… the elements that come in this kit are specialized, I have to admit). I know that there seem to be a lot of blues here, but don’t worry, the next coming sets will have greens and yellows and light blues as well, so you can use them for your girlies too! This set has 3 grungy papers and one patterned paper with stripes made out of a toothbrush-brush (literally! heh!) that I made and played around with. 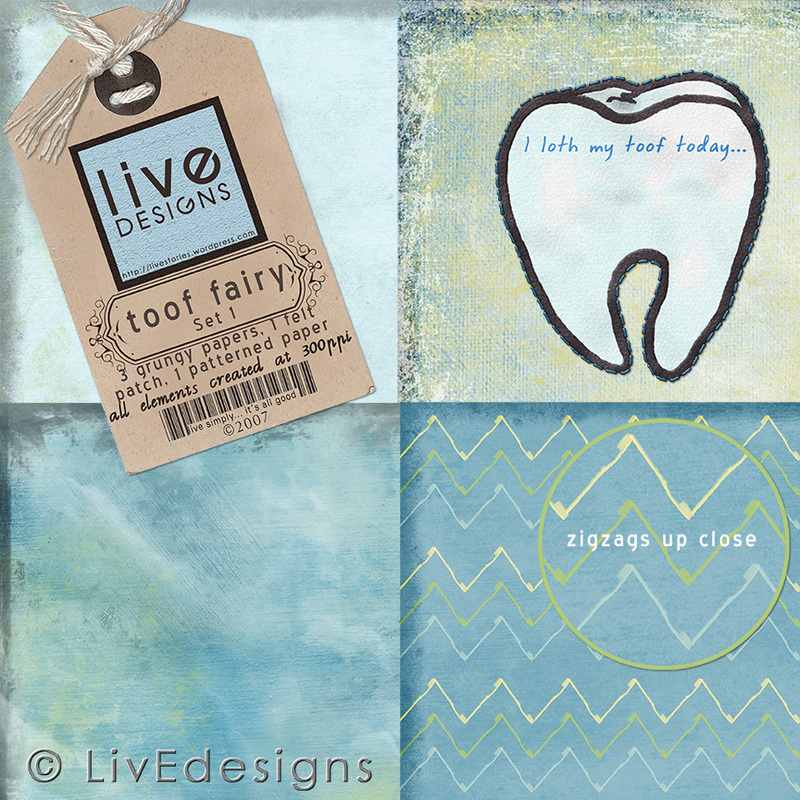 It also comes with a felt tooth patch that has stitches around it (doesn’t show up too well on the preview, but it’s there, trust me 😛 ) If you want to add some journaling on the patch without losing the texture, you can always use the blending modes… 🙂 Download Toof Fairy Set 1. Zip password is pearlywhite . Hope you like these, and thank you so much to all my thoughtful friends who leave love in my blog (and on my 4shared)!!! I truly am immensely grateful that you take the time… it is always so inspiring to read your words. Have a happy day! I’ll be back tomorrow with Set 2! Oh Liv…I don’t even know what to say. Thanks for sending thoughts and prayers from your side of the world. My world has definetly been turned upside down and shaken around, and I have needed those prayers and your support. Wow, to have such a great friend! This is adorable! My 5 YO son is starting to lose his teeth (lost 2 already) so this is perfect timing!! Thank you SO very much for sharing your incredible talent & time.